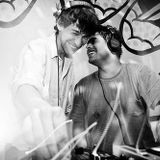 Yubaba is the brazilian free-style lounge project of Frederico Drummond and Pedro Gomide, an evolving journey from dub into house, with a trip hop feeling and a jazz taste. Their show features a diverse array of live musicians mixed with analog synthesizers in a digital environment, having performing formats that range from vocalist and percussionist with lap tops, to two computers plus midi-controllers and synthesizers. Active artists in the Brazilian chill-out and trance scenes for many years, they have appeared at several of the premiere festivals in Brazil, USA and Europe. They join their skills in this project, where they mix their cultural inﬂuences to recreate the eclectic and open-minded mood you could only ﬁnd in Brazil.